Swami Tejomayananda has been the Spiritual Head of the Chinmaya Mission Worldwide from 1993 -2016. Sudhakar’s revolutionary change came about the day he was attracted to a large banner announcing Swami Chinmayananda’s talks on Shrimad Bhagavad Gita, Chapter 3. A couple of talks later, he was so thoroughly inspired that he sought the permission of his mother to join the Chinmaya Mission’s residential Vedanta course at Sandeepany Sadhanalaya in Mumbai. Upon completion of the Vedanta course in 1975, Sudhakar was initiated into the Chinmaya Mission’s monastic order of acharyas (teachers) as Brahmachari Vivek Chaitanya. Over the years, he served as acharya at the Mission Centres in Bhopal, Kanpur, and Sidhabari. He conducted the first residential Vedanta course in Hindi at ‘Sandeepany Himalayas’ in Sidhabari. On October 21, 1983, Swami Chinmayananda initiated him into sannyasa, bestowing upon him the name, Swami Tejomayananda. He was then appointed as acharya of the Sandeepany Sadhanalaya ashram in Mumbai, where he taught two consecutive residential Vedanta courses in English. In 1989, Swami Tejomayananda was posted to Chinmaya Mission’s U.S. Centre in San Jose, California, where he remained as acharya until 1993. After Pujya Gurudev attained Mahasamadhi he became the Head of Chinmaya Mission Worldwide. 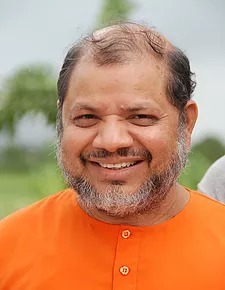 As the Head of Chinmaya Mission Worldwide, Swami Tejomayananda-now known in the Mission as Pujya Guruji-has continuously and dynamically pursued his guru’s grand spiritual and organizational vision. Progressive in thinking and precise in decision-making, he has inspired and executed many notable, innovative projects, including the Chinmaya International Residential School in Coimbatore, the Chinmaya Centre of World Understanding in New Delhi, the Chinmaya International Foundation near Cochin, the Chinmaya Heritage Centre in Chennai, the expansion of the Chinmaya Mission Hospital in Bangalore and the Chinmaya Vibhooti Vision Centre near Pune which is at present and still in progress. In overseeing the Mission’s global activities and projects, Swami Tejomayananda’s tours around the world are extensive and continuous. Throughout his travels, he conducts jnana yajnas (3-7 day Vedanta lecture series) in different cities and various countries every week. His gentle manner, devotional heart, intellectual clarity, joyful wit, and open availability have earned him inter-generational appeal and endeared him to millions across the globe. Fluent in Hindi, Marathi, English, and Sanskrit, Swami Tejomayananda’s talks, written commentaries, and original music, poetry, and text compositions exude lofty spiritual insights, incisive Vedantic scholarship, and universal harmony. His original Vedantic texts include Bhakti Sudha, Jnana Sarah, Manah Shodhanam, Dhyanasvarupam and Jivanasutrani. His acclaimed commentaries include Adi Sankara’s Drg-Drshya Viveka, Ramana Maharshi’s Upadesha Saram, Kapila Gita, and Yoga Vasistha. He has also translated into Hindi Swami Chinmayananda’s English commentaries on Shrimad Bhagavad Gita and the Upanishads. His book ‘Hindu Culture: An Introduction’ has been adopted as an academic text by some American schools. As a laudable devotional singer, he has recorded several albums with original music and lyrics. His profound, poignant, and pictorial talks on Sant Tulsidasa’s Ramacharitamanasa and Veda Vyasa’s Shrimad Bhagavatam are world-renowned, highlighting his spiritual wisdom and masterful storytelling.